So far I have identified 46 covers that use either authorised or unauthorised Banksy art. The first cover by Banksy apeeared in 1998 and was hand stencilled by Banksy himself. The record was by Bristolian dance duo The Capoeira Twins (4×3). 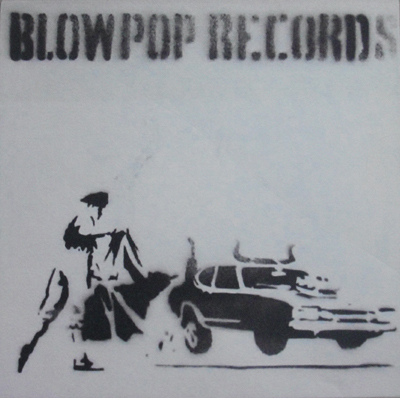 Banksy worked in the same building as Blowpop Records and used one of his stencils to decorate a promotional version of the record. One hundred copies were stencilled and these were distributed to DJs. Promo for The Capoeira Twins "Four". 100 copies handstencilled by Banksy. As the artists were unknown, it is not certain that many of the original hundred copies have survived. There was also a promotional box made that had the stencilled design. There were probably only a few of these made and I have never seen one. Hiphop gruppen One Cut had Banksy design the cover for their first releases “Cut Commander”, “Mr. X” and “Underground Terror Tactics” together with their first album “Grand Theft Audio”. Banksy made a second hand stencilled cover for a promotional release of Norwegian duo Röyksopp’s first LP “Melody A.M.” in 2002. One hundred numbered copies were made. Numbered promo for Röyksopp's 2001 album "Melody A.M." - handstencilled by Banksy. In 2003, Blur had Banksy design the cover for their album “Think Tank” together with the covers for three of the four singles culled from the album. Since then only a few covers have used Banksy’s art officially. These include Benjamin Zephaniah’s “Naked”, Talib Kweli’s “Madlib Liberation” and a “Peace Not War” compilation released in February 2004 together with the magazine The Big Issue. DJs Danger Mouse and Dirty Funker have used Banksy’s images on record covers unsanctioned. These have usually been released as limited editions. 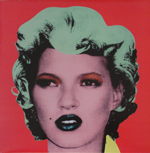 Dirty Funker’s reworking of The Knack’s hit “My Sharona” called “Let’s Talk Dirty” used Banksy’s famous Kate Moss portrait. This record was first issued with the unadulterated portrait on the cover’s front and rear. A second pressing had the record’s title on a banner of the model’s eyes. The original cover has become very rare. Other titles by DJ Danger Mouse have been issued as limited editions on his own label, including “From Man to Mouse” and “Keep It Real”, which was released with four different cover colours. Dirty Funker’s “Future” single was released with five colour variations on the cover. 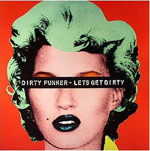 First pressing of Dirty Funker's "Let's Get Dirty" Single with Banksy's portrait of Kate Moss. Banksy’s stencils were used by the hiphop group One Cut for their singles “Cut Commander”, “Mr. X” and “Underground Terror Tactics” as well as on their LP “Grand Theft Audio” released 1998–2000. Other authorised releases include a C D my Monk & Canatella entitled “Do Community Service”, a CD by Benjamin Zachariah called “Naked” with several Banksy images in the booklet and three compilations entitled “We Love You… So Love Us”. The first of these was released as a limited edition LP while the other two were only available as CDs. 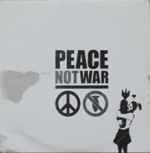 A further rare CD with official Banksy art was the “Peace Not War” CD given away with the February 2004 number of the magazine “The Big Issue”. It seems that few of these compilation CDs have survived. "Peace Not War" compilation CD given away with The Big Issue with Banksy's "Girl clutching a bomb" image on the cover and CD. The plan is to present as many covers as possible in an exhibition this summer and possibly write an article about Banksy’s record cover art. I have managed to collect the majority of the record covers that use Banksy’s art. The biggest thrill was obtaining a copy of Röyksopp’s handstencilled “Melody A.M.” cover. My collection is almost complete with only the Capoeira Twin’s “Four” promo missing. The second pressing had the title banner across Kate's eyes. No matter what one collects, there will almost always be one item missing from one’s collection. I’ve been lucky for the most part. I did collect complete sets of The Beatles’ picture disc singles and their limited edition CD boxes, although I almost didn’t manage the latter. I missed the first box of four CDs and the very limited “Yellow Submarine” box but managed to find the former unexpectedly in a Stockholm record shop and the latter at Vinyl Experience in Hanway Street in London. It took me a while to collect all six cover variations to Led Zeppelin’s “In Through the Out Door” album, but eventually I managed it. My collection of Andy Warhol’s record covers will, I realise, never be complete. There are a couple of covers that are ridiculously rare and even one that only exists as a test lithograph (the record appears never to have been released.) I am happy to anyway have a couple of really rare covers. My current interests are collecting record covers that use Banksy’s street art and covers with Klaus Voormann’s art. Finding Banksy’s covers has not been difficult. I have managed to obtain all but two – his first cover (which is ridiculously rare) – and a CD of poetry that was only released locally in Bristol. Klaus Voormann’s covers have been relatively easy to find, too, despite his career spanning fifty years. So far I lack his very first cover for a German band called The Typhoons and his latest cover for a band called The Dogs of Bali, which thus far has only been released as a download. I was pipped at the post for a copy of the The Typhoon’s cover last night when one was sold in Ebay. Someone managed to top my bid!